We recently took an overnight trip to the east side (east side of the cascades) near the Columbia gorge. We spent most of our time just exploring the landscape. We saw some very cool things. An owl sitting on its nest, a coyote den, petrified wood, lots of pretty flowers, the site of an attack on a porcupine and more. The first day we explored along the edge of a canyon with a nearby stream winding between some small sand dunes. I'm not sure what kind of flowers these are and unfortunately do not have a good plant guide for that side of the mountains, but it looks like it is in the pea family. I don't know what these tracks are either. 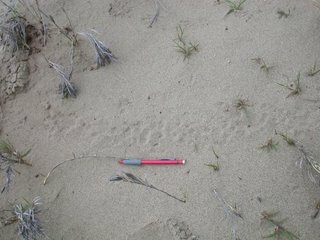 I would guess a medium sized rodent as they wandered through the sand often ending in holes a couple of inches across. 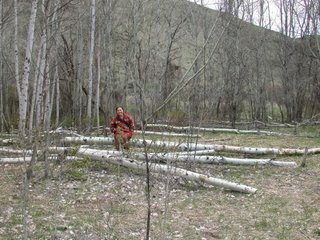 That evening I harvested a mullein stalk and got an aspen branch and with a little help got my first coal on a hand drill kit that had been wild gathered that day. That was fun, but it is still a different challenge over here on the west side. I think I could do it if I found a downed big leaf maple of the right size (though maybe not if it had been wet a lot recently), but that is not a given. The next day we spent in a smaller canyon with its own set of interesting things. There were hawks nesting, more flowers and tons (literally) of beaver sign. All the fallen trees were done in by beavers. I wonder how much longer the stand will last around there at the rate they seem to be going through them. A small group of us hiked up to the canyon rim and explored around. 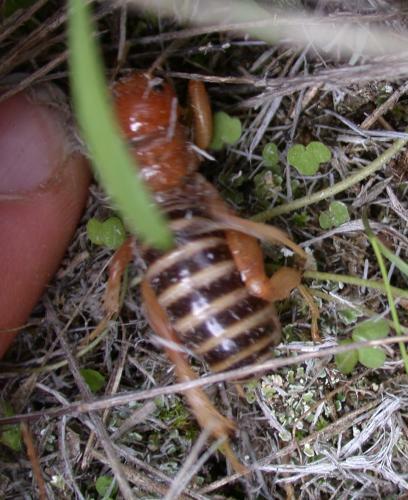 While digging a lily bulb we turned up this Jerusalem Cricket. Apparently they eat bulbs - maybe we stole the meal out of his mouth. I had a great time on the trip, it was a good reminder of how fun it can be to get out with a group of people and how much more can be seen with that many eyes spread out over the landscape. Japanese Knotweed is an invasive plant that grows in large patches in our region. When I was a kid we called it bamboo (it bears some similarity to bamboo, including large chambered stems). When young it looks a bit like asparagus and the shoots are edible until they become too fibrous (around two feet tall they begin to get too tough to bother with) and taste quite similar to rhubarb. The Friday after the knotweed expedition mentioned in the previous post we went out for more. This time the four of us harvested around 40 pounds of it. That made for a busy day of processing on Saturday. With the addition of a couple of extra cooks, we ended up making 10 different knotweed dishes - most of them more or less invented on the spot. 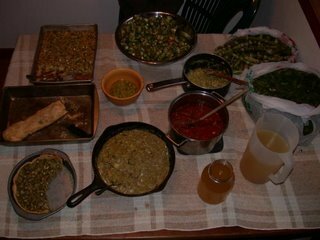 We made sweet sauce, two savory sauces, juice, stir fry, custard, a tart, a quiche-like fold over, a fruit and granola mixture, and steamed some. I was pleased with the outcome in almost all cases. It's nice to be moving out of the introspection of winter. Introspection is good but so is action. There were some fun activities the last couple weeks of the winter term. We burned bowls out of logs and purified water in them, had a sensory awareness day spent blindfolded (read more about it on Rees's blog), among others. Then over spring break I went on a vision quest. I had high hopes and high fears for my vision quest. The reality was below such expectations in both cases. In most ways it wasn't as hard or boring as I thought it would be, however I ended up feeling fairly sick the last half of the 4 day fast which really challenged me. I ended up sticking it out, but didn't feel like I recieved much insight during the time. Of the 11 people questing at the same time, my experience seemed fairly unique both in feeling so sick and not experiencing much insight. Fortunately over the following couple of days I had a couple of important insights, which I can't directly link to the quest, but seem likely to have stemmed from that time. I did have some cool nature experiences while sitting out there, including a barred owl flying in during the evening light and perching briefly in two different trees within 10 feet of where I was sitting. The day after the vision quest wrapped up I went out with some friends and took a leasurely expedition to harvest knotweed which we used to make custard, sauce, juice and stir fry. Yesterday a couple of us harvested nettles to make nettle "chips" and today I harvested dock, nettle, and dandelions to put in a stir fry. 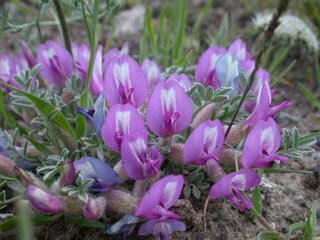 There are several wild flowers now in bloom as well, including coltsfoot, violet, huckleberry, and trillium. Tomorrow I'm planning on looking for fish.